Tonight's main event is a heavyweight contender's fight between Ben Rothwell and Junior Dos Santos! Welcome to PeachMachine's coverage of Fight Night 86 in Croatia. I do coverage a little differently... I'll bring you the action, but also my thoughts, and at the end I'll give the match a grade. You'll figure it out... Enjoy! Peach's Perspective: Either guy could have won the decision, but the crowd was not expecting that call and booed fervently. 3 stars! Just watch the second and third rounds. This one won't last long. Asker already dove for a takedown and they end up on the cage. Cannonier is really light on his feet. WOW! A monsterous left hook ended Asker's night early. It should have been a walk off shot, but the ref didn't stop it so Cannonier landed some nasty elbows for the finish. I really liked Cannonier, but then he babbled about god and made me hate him. So Jared, what you're telling me is that god helped you concuss another of his creations for your personal glory? What a jerk god must be. Official Result: Jared Cannonier wins by referee stoppage at 2:44 of the very first round... As opposed to the first round that's not the VERY first round. Peach's Perspective: Definitely watch this one. 3.5 stars. Well I'm an idiot. I picked Whiteford in my league but I confused him with Robert Whittaker. Almost nothing happened in round 1. Martins landed some strong shots and hurt Whiteford but not for long. I guess Martins 10-9 but really I'd got 10-10. The damage differential was not significant. Martins did a lot more damage in round two as Whiteford looks outclassed in there. I hope nobody bet my bad pick. Whiteford did stick a nice takedown near the end of round 2. I'd go another 10-10 but really, probably 20-18 Martins. Round three was Martins pretty much landing at will. He'll probably get the unanimous decision. I have it 30-29 for Martins. Peach's Perspective: Skip. This was an ok fight. 2 stars, but skip it. Neither of thee guys made much of an impression on me. Stasiak took him down and got the rear naked choke pretty quickly. Peach's Perspective: It was fast. Not worth watching though. It went exactly as my one sentence read. 2.5 stars for the finish. DANG SON! About nothing happened until 90 seconds to go in the round and Taisumov said, "No more, my friend. Time for you to sleep." And he ended it with a barrage of hard hands until the final blow which was an uppercut that dropped Hadzovic. Great walk-off finish form Taisumov. Official Result: Mairbek Taisumov wins byt TKO at 3:44 of round 1. Peach's Perspective: WATCH THIS ONE! 4 star performance by Taisumov. Entwistle is one of these leg lock guys who gets solely focused on that, which is exactly what happened, but he didn't get it. Entwistle got close a few times, but he left his head wide open and Perez landed a ton of unanswered head shots and got the stoppage. Those leg locks are great if you get them but if you miss, your hands are committed to that lock so they can't be used to defend your face. Unfortunately, he was well within Perez's range. Official Result: Alejandro Perez wins by TKO at 4:04 of round 1. Peach's Perspective: Go ahead and watch. First round finishes are usually worth watching. 2 stars. Apparently Entwistle is complaining that Perez greased his legs. That seems unlikely, but you never know. Cummings landed a solid 1, 2 combo that dropped Dalby. Cummings went for the D'Arce choke but to no avail. A lot of action in that first round from both men, but I have Cummings 10-9. Cummings agains looked really good in the second and lit up Dalby. Another 10-9 for Cummings. With about 2:30 left in the third, Dalby threw a kick and then just fell down. This gave Cummings a chance to pass the guard and control the ground game. Dalby had a chance on the stand up to do some damage, and he went for it, but it was too little too late. 30-27 Cummings. Peach's Perspective: This was actually a fun fight. I'd watch it. 2.75 stars. Stanciu committed to a standing guillotine early and executed some nice BJJ but Moroz held on. Then Moroz got her back and the body triangle and worked for the RNC but was not successful. 10-9 Moroz. Almost nothing happened in round two until Moroz found herself on top working for a submission. Round 3 was incredibly boring. They laid in this weird north south dueling arm bar and triangle position for like 2 minutes. I have no idea who won this fight, but I know who lost... me. That sucked. More initials for ya'll... IP got a huge pop. This is the first fight that the people are into. JB got his back but fell off and IP took over in the ground and pound department. IP 10-9. A whole lot of clinching until an AWESOME striking exchange by both men. They connected with some big shots, JB probably getting the best of it, but IP landed too. A lot of great action in round two, with both me bloodied up, and the crowd way into it. 10-9 JB who came back and in my opinion won the round. Both men look like they're dead starting off round 3. JB got the takedown with about 3 minutes left which was smart because he was gassed. This is going to be an interesting decision. JB did a lot of damage on the ground in the later half of the third, and I think JB won the round and the fight 29-28. Peach's Perspective: This was a WAR! At least round 2 was... 3.5 stars. THAT'S IT FROM PEACHY BABY (@PEACHMACHINE), STEVIE J WILL TAKE IT FROM HERE. Stevie J: I wasn't able to get back from my Daron Cruickshank interview in time for this fight, but the judges scored it for Johnson by unanimous decision 29-28 X3. I also missed the first round of this fight but got back in time for R2 so HERE WE GO. Blaydes is in the white trunks and Ngannou the black. Ngannou is taken down 1:54 into the second round and Blaydes is able to quickly get back up. The two reset at the halfway point of the ring and so far this round Ngannou seems to be getting the better of the exchanges. Between whatever happened last round and this round Blaydes has had his right eye swollen shut. I don't know why my brain went there (maybe because Jon Anik mentioned cardio) but this is like Kimbo Slice vs. Dada 5000 if they were both quality in shape athletes. Ngannou looks like the man with more upside in his career. I'm not sure a doctor will let Blaydes see a third round if they get a good look at his eye. in HD on a 50" TV, I sure wouldn't. And I was right - the doctor has waved this one off. Ngannou wins by TKO (doctor) 5:00 of the second round. Gonzaga is in the white trunks and has a record of 17-10 for tonight's main event. He fights out of Worcester, MA by way of Rio De Janeiro, Brazil. Lewis is in the black trunks and is 14-4, 1 NC, fighting out of Houston, Texas. The referee in charge is Marc Goddard. Lewis lands a head kick right from the get go but doesn't get it full flush. Gonzaga responds with the 24th takedown of his UFC career and goes for full mount, taking the back in the process, eating a big right hand from behind. Lewis is able to stand up at 1:54 and fire a reverse elbow. Gonzaga goes right for another takedown. He just keeps digging and digging for it as Goddard calls for more work at 2:48. After a "last warning" he resets them at 3:02. Surprise surprise Gonzaga puts him back on the fence looking for a takedown. Lewis spins him away at the four minute mark. Gonzaga goes hard for a leg trip, hard for a judo throw, neither one work. They are reset again off the fence at 4:30. Lewis paws for the range and suddenly he finds it! GONZAGA GOES OUT FROM THE RIGHT and Lewis gets in a shot or two on the ground before Goddard can get in to stop him. Lewis has a little fun afterward celebrating on the fence and pantomiming that shhhhhh he put Gonzaga to SLEEP. Derrick Lewis wins by knockout at 4:48 of the first round. The referee in charge is Leon Roberts. 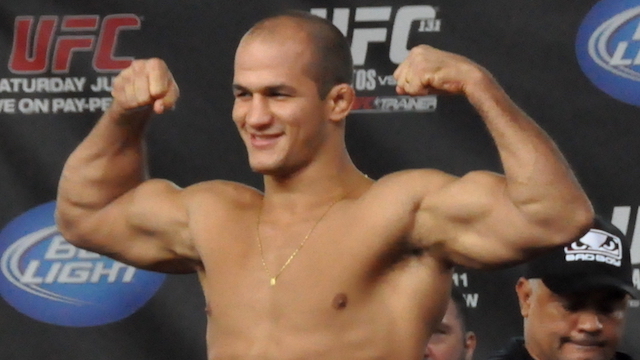 JDS is 17-4 and he fights out of Salvador, Bahia, Brazil as the former UFC heavyweight champion. Rothwell is 36-9 and he fights out of Kenosha, Wisconsin as the #4 heavyweight contender in the world. Rothwell is in the black trunks and JDS is in the white. Here we go! I'm going to make this long story short since the main event went the full five rounds. Rothwell's best round was arguably the first, although JDS seemed to be complaining about a finger to the eye before Rothwell went on offense. Before and after that JDS was landing body shots. The Zagreb crowd was clearly in favor of JDS and chanting CI-GA-NO even when he ate the kind of overhand rights that would drop most men. Still JDS weathered the storm and landed enough significant strikes to the body and head to stay relevant. It wasn't a blowout round for either man. Ultimately though the judges did not give Rothwell this round, nor did they give him any other round of the fight, and I'd have to agree with that assessment. JDS got better the longer this fight went on. In the second round you could see Rothwell's pink face being turned bright red, and his nose being turned a few shades of purple. An eyepoke by Rothwell brought on a warning but not a deduction. In the last minute blood was clearly running down Rothwell's face after he got creamed by an overhand right, and he was so wobbly that JDS knocked him off his feet with a push kick. Things did not get any better for 'Big Ben' over the next 15 minutes, leading to a unanimous decision of 50-45 times three for the former UFC champion Junior Dos Santos. He was outboxed, outworked, and unable to land anything other than single shots that were a prayer. JDS was a whirling dervish to the body and the head, landing combos, or as Kenny Florian put it JDS could "pop move, pop move" with ease. Rothwell got slow and stiff while Cigano stayed light on his feet. It was a sterling performance from a guy who I thought might have been beyond title contention after a loss to Overeem. Suddenly he's back in the mix.